Home Florida Photos Tampa USA WTH Legend of the Two-Headed Gator - Real or Fake? Legend of the Two-Headed Gator - Real or Fake? I've lived here in Tampa, FL now for a few years. One of the things we love the most, is the wildlife... especially the native alligators in our back yard. A Two-Headed Gator OR a case of Reptilian Photoshop? However, I only recently heard about this strange sighting from a few years back - and after talking to others, the jury is still out on whether it's real or a hoax - I will let you guys decide for yourself! At the time (2014), a Florida artist came out and claimed that he had seen a two-headed alligator while walking his dog. Florida wildlife officials were immediately skeptical. Justin Alan Arnold uploaded the picture he took on Facebook... although it was liked and shared thousands of times, experts from the Florida Fish and Wildlife Conservation Commission questioned the authenticity of the image. 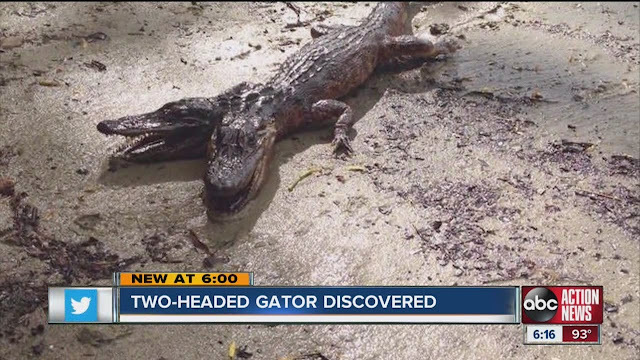 The commentary that came with the photograph stated, "Two-headed alligator spotted in Tampa, Florida along the Hillsborough River in the Seminole Heights neighborhood. According to Florida Fish and Wildlife, this alligator has been reported by several people. They explained that failed separation of monozygotic twins is common in reptiles and amphibians but they rarely reach this juvenile state." Officials from the FWC stated that they hadn't received any calls about a two-headed alligator, despite Arnold's commentary. "Conventional knowledge is that when these deformities occur, the hatchlings do not survive unless cared for [by humans] and often, not even then"
So I now leave it with you all, dear readers - A Two-Headed Gator OR a case of 'not-too-bad' Reptilian Photoshop?